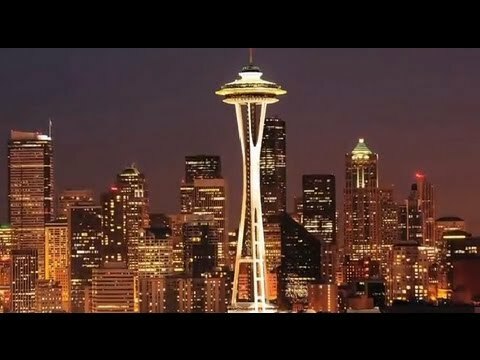 Space Needle – how it was built to withstand strong earthquakes, hurricanes, and other extreme weather conditions – as part of the travel series by GeoBeats. Do you ever look at the Space Needle and wonder why it doesn’t keel over during high winds since it seems to have more mass towards the top? Well, actually, this iconic structure in Seattle is an engineering marvel and is one of the safest places in the world during extreme weather or ground conditions. Lightning strikes? No problem. On its roof, there are 24 lightning rods to shield this landmark from lightning strikes. Also, you may be surprised to learn that the Space Needle can withstand wind speeds of 200 miles per hour – for context, those are category-5 hurricane winds. For every 10 mph, it sways 1 inch. And on windy days, the elevators automatically slow down from 10 mph to 5 mph. Moreover, the Space Needle is constructed to withstand 9.0 earthquakes on the Richter Scale. During the 2001 earthquake that measured 6.8 on the Richter Scale, the structure did not suffer any significant damage except there was sloshing of some water from the toilets. The foundation of Space Needle plays a big role in its stability. The foundation hole was 30 feet in depth and 120 feet across and 467 cement trucks were used to pour concrete in a span of 12 hours – such a large concrete effort had not been tried in the West before. The foundation weighs a whopping 5850 tons and there’s 250 tons of reinforced steel. The Space Needle structure itself weighs 3700 tons which means the foundation weighs 2150 tons more than the structure. To further strengthen this great landmark, there are 72 bolts, each 30 feet long, tied to the foundation. Due to the way it has been built, the center of gravity of the Space Needle is at just 5 feet above ground even though the whole tower is over 500 feet tall. So next time you are visiting the Space Needle, take time to appreciate not only its aesthetic beauty but also its ingenious construction. Taxi service in Seattle is varied. It isn’t an inexpensive option, however, so many people prefer to avoid trying to get a taxi. Many travelers find that it pays off to call ahead when you need taxi service because they can be hard to find out on the street. Seattle Landmark and Tourist Attraction. CLEARLY BREATHTAKING. For the first time in half a century, the Space Needle has been totally transformed to take your visit to the next level — and beyond. Seattle’s “must see” is now a “must do” following the Space Needle’s multimillion-dollar renovation. Glide onto The Loupe, the world’s first and only rotating glass floor, for never-before-seen views of the structure and the city. Seattle CityPASS® includes a Day/Night ticket to the Space Needle - that's two visits to the top in 24 hours! Skip ticket lines and save 45% with CityPASS®. Space Needle.This is probably the most romantic of the city’s major tourist attractions. It’s got an amazing view plus an indulgent rotating restaurant at the top. Downtown Seattle, WA Hotel Travelodge Seattle by The Space Needle is a hotel in Seattle, WA near the Space Needle. In fact, we are only 2 blocks away from this well-known icon, plus the EMP Museum and Chihuly Garden and Glass.